In the ever-raging Map War, Google seems to be not only a first mover, but the boldest mover. According to the Globes, an Israel-based publication, Google is reportedly set to acquire the Israeli transit and navigation company Waze for $1.3 billion, making it one of the larger Google acquisitions in recent memory. This latest development comes amid swirling rumors that Waze would be bought up by one of the big guys, by Facebook for $1 billion, Apple for $500 million and now Google. Waze provides information on traffic congestion, police presence, speed-sensing cameras, and other transportation-related information thanks to the crowdsourced information flowing in from its almost 50 million users. According to a number of other Hebrew sources, the deal will be in all cash. 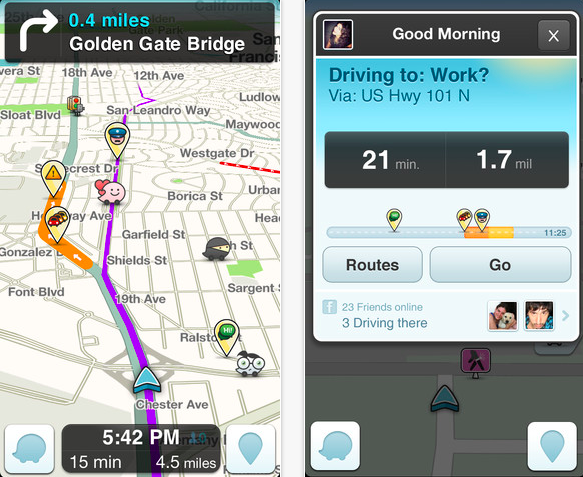 Noam Bardin will reportedly remain as CEO and Waze will also continue as its own brand. Waze’s R&D facility, as well as their offices in Israel, will remain in place for at least three years. We had heard originally that Apple was interested in Waze, which made perfect sense at the time considering Apple was building and releasing a buggy, inadequate Maps app. Waze probably could have helped out quite a bit. However, those rumors died down to make room for new ones, namely that Facebook was considering buying the social satellite-navigation company. In fact, Globes reports that Facebook executives went into negotiations with Waze right in Israel, but neither company could come to a comfortable resolution. But perhaps more interesting, Google moved in to have chats with Waze while Facebook was still in negotiations to buy, showing just how eager Google is to block out potential competitors in the mapping space. Neither Google nor Waze is commenting on the acquisition at this moment, but this isn’t the first time that the search giant has been paired with Waze. Just last month, Bloomberg reported that the companies were in talks, and that Waze was seeking more than $1 billion. The report says the deal has just entered due diligence, and details are subject to change. Google’s long-term goal with Waze is somewhat unclear. It obviously increases its footprint in Israel, where it currently operates two offices, and there is a thriving startup scene, from which Google has already plucked Labpixies and Quicksee. But looking further, this is also a good way to keep competitors like Apple and Facebook away from such reliable and popular mapping software. Remember, Google’s Maps application is already a world-class product, with nothing even remotely close following behind in terms of competition. But that’s not to say that folks aren’t trying. Apple booted Google Maps as the default mapping app on its iDevices with the launch of iOS 6 and the iPhone 5. Unfortunately for Apple, Apple Maps is abysmal. By buying Waze, Google keeps competitors like Apple and others away from the easy out, which would be an acquisition of a company with already-working and reliable technology. With this deal, Google effectively blocks Apple and Facebook from even having a chance. See, Facebook, Apple, Microsoft and any other big tech player will be focusing on location technology as a way to bolster other services. Maps is the spinal cord of the mobile ecosystem. It affects advertising, other social tools and apps, and e-commerce. Apple, Facebook and friends won’t give up on owning our location data anytime soon, but Google is doing a good job of blocking out the potential to buy technology instead of build it. Waze was founded back in 2007, and has since raised a total of $67 million from investors like KPCB, Horizon Ventures, Blue Run Ventures, Magma Venture Partners, and Vertex Venture Capital.